Do not think it strange, then, if I say to you, who each day resort to teachers and hold converse with the famous men of the ancients through the words which they have left behind them, that I myself have discovered something of especial advantage to you. This it is, and naught else, that I have come to offer you as my counsel-that you should not surrender to these men once for all the rudders of your mind, as if of a ship, and follow them wheresoever they lead; rather, accepting from them only that which is useful, you should know that which ought to be overlooked. What, therefore, these things are, and how we shall distinguish between them, is the lesson which I shall teach you from this point on. II. We, my children, in no wise conceive this human life of ours to be an object of value in any respect, nor do we consider anything good at all, or so designate it, which makes its contribution to this life of ours only. Therefore neither renown of ancestry, nor strength of body, nor beauty, nor stature, nor honors bestowed by all mankind, nor kingship itself, nor other human attribute that one might mention, do we judge great, nay, we do not even consider them worth praying for, nor do we look with admiration upon those who possess them, but our hopes lead us forward to a more distant time, and everything we do is by way of preparation for the other life. Whatever, therefore, contributes to that life, we say must be loved and pursued with all our strength; but what does not conduce to that must be passed over as of no account. Now just what this life is, and how and in what manner we shall live it, would take too long to discuss in view of our present purpose, and would be for the more mature to hear than for hearers of your age. After saying this much at least, I may perhaps be able to show you that if one sums up all the happiness together from the time men have first existed and collects it into one whole, he will find that it is equivalent not even to a trivial part of those other goods, but that the total of the goods of the present life is more removed in value from the least among the former goods of the other life than shadows and dreams fall short of reality. Nay, rather - that I may use a more suitable illustration - to the degree that the soul is more precious than the body in all respects, so great is the difference between the two lives. Now to that other life of the Holy Scriptures lead the way, teaching us through mysteries . Yet so long as, by reason of your age, it is impossible for you to understand the depth2 of the meaning of these, in the meantime, by means of other analogies which are not entirely different, we give, as it were in shadows and reflections, a preliminary training to the eye of the soul, imitating those who perform their drills in military tactics, who after they have gained experience, by means of gymnastic exercises for the arms and dance-steps for the feet, enjoy when it comes to the combat the profit derived from what was done in sport. So we also must consider that a contest, the greatest of all contests, lies before us, for which we must do all things, and, in preparation for it, must strive to the best of our power, and must associate with poets and writers of prose and orators and with all men from whom there is any prospect of benefit with reference to the care of our soul. Therefore, just as dyers prepare by certain treatments whatever material is to receive the dye, and then apply the color, whether it be purple or some other hue, so we also in the same manner must first, if the glory of the good is to abide with us indelible for all time, be instructed by these outside means, and then shall understand the sacred and mystical teachings; and like those who have become accustomed to seeing the reflection of the sun in water, so we shall then direct our eyes to the light itself. III. Now if there is some affinity between the two bodies of teachings, knowledge of them should be useful to us; but if not, at least the fact that by setting them side by side we can discover the difference between them, is of no small importance for strengthening the position of the better. And yet with what can you compare the two systems of education and hit upon the true similitude? Perhaps, just as it is the proper virtue of a tree to be laden with beautiful fruit, although it also wears like a fair raiment leaves that wave about its branches, so likewise the fruit of the soul, the truth is primarily its fruitage, yet it is clad in the certainly not unlovely raiment even of the wisdom drawn from the outside,3 which we may liken to foliage that furnishes both protection to the fruit and an aspect not devoid of beauty. Now it is said that even Moses,4 that illustrious man whose name for wisdom is greatest among all mankind, first trained his mind in the learning of the Egyptians, and then proceeded to the contemplation of Him who is. And like him, although in later times, they say that the wise Daniel5 at Babylon first learned the wisdom of the Chaldaeans and then applied himself to the divine teachings. IV. But that this pagan learning is not without usefulness for the soul has been sufficiently affirmed; yet just how you should participate in it would be the next topic to be discussed. First, then, as to the learning to be derived from the poets, that I may begin with them, inasmuch as the subjects they deal with are of every kind, you ought not to give to your attention to all they write without exception; but whenever they recount for you the deeds or words of good men, you ought to cherish and emulate these and try to be as far as possible like them; but when they treat of wicked men, you ought to avoid such imitation, stopping your ears no less than Odysseus did, according to what those same poets say, when he avoided the songs of the Sirens.6 For familiarity with evil words is, as it were, a road leading to evil deeds. On this account, then, the soul must be watched over with all vigilance,7 lest through the pleasure the poets' words give we may unwittingly accept something of the more evil sort, like those who take poisons along with honey. We shall not, therefore, praise the poets when they revile or mock, or when they depict men engaged in amours or drunken, or when they define happiness in terms of an over-abundant table or dissolute songs. But least of all shall we give attention to them when they narrate anything about the gods, and especially when they speak of them as being many, and these too not even in accord with one another. For in their poems brother is at feud with brother, and father with children, and the latter in turn are engaged in truceless war with their parents. But the adulteries of gods and their amours and their sexual acts in public, and especially those of Zeus, the chief and highest of all, as they themselves describe him, actions which one would blush to mention of even brute beasts-all these we shall leave to the stage-folk. These same observations I must make concerning the writers of prose also, and especially when they fabricate tales for the entertainment of their hearers. And we shall certainly not imitate the orators in their art of lying. For neither in courts of law nor in other affairs is lying befitting to us, who have chosen the right and true way of life, and to whom refraining from litigation has been ordained in commandment.8 But we shall take rather those passages of theirs in which they have praised virtue or condemned vice. For just as in the case of other beings enjoyment of flowers is limited to their fragrance and color, but the bees, as we see, possess the power to get honey from them as well, so it possible here also for those who are pursuing not merely what is sweet and pleasant in such writings to store away from them some benefit also for their souls. It is, therefore, in accordance of the whole similitude of the bees,9 that we should participate in the pagan literature. For these neither approach all flowers equally, nor in truth do they attempt to carry off entire those upon which they alight, but taking only so much of them as is suitable for their work, they suffer the rest to go untouched. We ourselves too, if we are wise, having appropriated from this literature what is suitable to us and akin to the truth, will pass over the remainder. And just as in plucking the blooms of a rose-bed we avoid the thorns, so also in garnering from such writings whatever is useful, let us guard ourselves against what is harmful. At the very outset, therefore, we should examine each of the branches of knowledge and adapt it to our end, according to the Doric proverb,10 "bringing the stone to the line." V. And since it is through virtue that we must enter upon this life of ours, and since much has been uttered in praise of virtue by the poets, much by historians, and much more still by philosophers, we ought especially to apply ourselves to such literature. For it is no small advantage that a certain intimacy and familiarity with virtue should be engendered in the minds of the young, seeing that the lessons learned by such are likely, in the nature of the case, to be indelible, having been deeply impressed on them by reason of the tenderness of their souls. Or what else are we to suppose Hesiod had in mind when he composed these verses which are on everybody's lips, if he were not exhorting young men to virtue?-that "rough at first and hard to travel, and full of abundant sweat and toil, is the road which leads to virtue, and steep withal. "11 Therefore it is not given to everyone to climb this road, so steep it is, nor, if one essays to climb it, easily to reach the summit. But when once one has come to the top he is able to see how smooth and beautiful, how easy and pleasant to travel it is, and more agreeable than that other road which leads to vice, which it is possible to take all at once from near at hand, as this same poet has said. For to me it seems that he has narrated these things for no other reason than to urge us on to virtue and to exhort all men to be good, and to keep us from becoming weak and cowardly in the face of the toils and desisting before reaching the end. And assuredly, if anyone else has sung the praise of virtue in terms like Hesiod's, let us welcome his words as leading to the same end as our own. Moreover, as I myself have heard a man say who is clever at understanding a poet's mind, all Homer's poetry is an encomium of virtue,12 and all he wrote, save what is accessory, bears to this end, and not least in those verses13 in which he has portrayed the leader of the Cephallenians, after being saved from shipwreck, as naked, and the princess as having first shown him reverence at the mere sight of him (so far was he from incurring shame through merely being seen naked, since the poet has portrayed him as clothed with virtue in place of garments), and then, furthermore, Odysseus has having been considered worthy of such high honor by the rest of the Phaeacians14 likewise that, disregarding the luxury in which they lived, they one and all admired and envied the hero, and none of the Phaeacians at the moment would have desired anything else more than to become Odysseus, and that too just saved from a shipwreck. For in these passages, the interpreter of the poet's mind was wont to declare that Homer says in a voice that all but shouts: "You must give heed unto virtue, O men, which swims forth even with a man who has suffered shipwreck, and, on his coming naked to land, will render him more honored than the happy Phaeacians." And truly this is so. Other possessions, in fact, no more belong to their possessors than to any chance comer whatever, quickly shifting now here, now there, as in a game of dice; but virtue alone of possessions cannot be taken away, as it remains with a man whether he be living or dead. It was for this reason indeed, as it seems to me, that Solon said this with respect to the rich: "But we will not exchange with them our virtue for their wealth, since the one abides always, while riches change their owners every day." And similar to these words are those of Theognis15 also in which he says that God, whomsoever he means indeed by this term, inclines the scale for men at one time this way, at another that way, now to be rich, but now to have nothing. It seems to me that such harmony between profession and life is very much as if a painter had made a likeness of a man of quite wondrous beauty, and this same man should be such in reality as the painter had portrayed him on his panels. For brilliantly to praise virtue in public, and to make long speeches about it, but in private to rate pleasure before temperance, and self-interest before justice, resembles, as I would assert, those stage-folk who bring out plays and often appear as kings and potentates, although they are neither kings nor potentates, and perhaps not even free men at all. Again, a musician would not willingly consent that his lyre should be out of tune, nor a leader of a chorus that his chorus should not sing in the strictest possible harmony;18 but shall each individual person be at variance with himself, and shall he exhibit a life not at all in agreement with his words? But one will say, quoting Euripides, "the tongue has sworn, but the mind is unsworn," If we are to hearken to the words of Plato - "to appear to be just without being so." VII. As to the passages in literature, then, which contain admonitions of excellent things, let us accept this procedure. And since the virtuous deeds, likewise, of the men of old have been preserved for us, either through an unbroken oral tradition or through being preserved in the words of poets or writers of prose, let us not fail to derive advantage from this source also. For example, a certain fellow, a market-lounger, kept railing at Pericles,19 but he paid no attention; and he kept it up all day long, he giving Pericles a merciless dressing of abuse, but he taking no heed of it. Then when it was already evening and dark, though the man was scarcely desisting, Pericles escorted him home with a light, lest his own schooling in philosophy be utterly brought to naught . Again a certain man, having become enraged against Eucleides of Megara, threatened him with death and took oath upon it; but Eucleides took a counter-oath, to the effect that verily he would appease the man and make him put aside his wrath against him. How very valuable it is that an example of this kind should be recalled to memory by a man who is on the point of being held in the grip of a fit of passion! For one must not put a simple-minded trust in the tragedy when it says "Against enemies anger arms the hand," but, on the contrary, we should not permit ourselves to be aroused to anger at all; but if this is not easy to achieve, we should at least apply reason to our anger as a sort of curb and not allow it to be carried too far beyond the bounds. VIII. But let us return again to the same subject of which we were speaking at the beginning: we ought not to take everything without exception, but only such matter as is useful. For it is disgraceful to reject foods that are harmful, yet for the teachings which nourish our souls to have no concern, but to charge onward like a mountain torrent, carrying along everything it chances upon. And further, what sense or reason is there that a pilot does not heedlessly give over his ship to the winds, but steers it to harbor, or that a bowman shoots at a mark, or indeed, that any bronzesmith or worker in wood strives for the end proper to his craft, but that we should fall behind even such artisans, in respect at least to the ability to perceive our own interests? For can it be that handicraftsmen have some end in view in their work, but that there is no goal for the life of man, keeping his eye upon which that man at least, who does not intend to be wholly similar to the brute beasts, ought to do and say whatever he does or says? In that case we should really be like ships without ballast, if we had no intellect sitting at the steering-oars of our soul, being tossed up and down aimlessly through life. On the contrary, it is just as in the athletic contests, or if you prefer, the competitions in music: there are practice exercises in preparation for those contests in which the prize offered is a crown,24 and no one who is training for the wrestling-match or the pancratium takes to practicing on the lyre or the flute. Certainly Polydamas25 did no such thing, but before the contest at Olympia he practiced bringing speeding chariots to a stop, and by this means was wont to enhance his strength. And Milo26 could not be pushed away from his greased shield, but held out against the pushing no less firmly than those statues hold which are fastened to their bases with lead. And, in a word, their exercises were a preparation for the games. But if they had wasted their time on the airs of Marsyas or Olympus27 the Phrygians, abandoning the dust and the exercises of the gymnasia, would they soon have obtained crowns or glory, or would they have escaped incurring ridicule for their physical condition? Neither, on the other hand, did Timotheus28 neglect his composition of chorals and spend his time in the wrestling-schools. For had he done so it would not have been possible for him so far to excel all men in the musical art that he could arouse the passions through his vehement and severe harmony and yet, on the other hand, through his relaxed and sensuous strains, mollify and allay them again, whenever he willed. It was by such art that once, when he was playing the Phrygian mode to Alexander on his flute, he caused the prince, as it is said, to leap up and rush to his arms in the midst of a banquet, and then, by relaxing the harmony, brought him back again to his boon companions29. So great is the power, in both music and the athletic contests, produced by practice directed towards the attainment of the end in view. And since I have made mention of crowns and athletes, let me add that these men, after enduring toils by the thousand, and after increasing their strength by every possible means, after shedding much sweat in the labors of the gymnasium, and taking many blows at the school of the physical trainer, and choosing, not the pleasantest fare, but that which the gymnastic masters had prescribed, and in all other ways (that I may not waste time by enumerating them) so passing their days that their life before the contest might be a preparation for the contest, then, when all the moment comes, they strip for the race, undergo all hardships and run all risks, so as to receive a crown of wild olive or of parsley or of some such thing, all that they may win the victory and have their name proclaimed by the herald. But as for us, before whom are set for the life we lead prizes so marvelous in multitude and in grandeur that they cannot be described in words, if we sleep on both ears and lead lives of abundant licence, will it be possible for us to reach out and seize them with one hand? In that event slothfulness would be of great value for living, and the Sardanapalus30 would carry off the highest prizes of all as regards happiness, or even Margites, who was neither a ploughman nor a digger nor anything else useful in life , as Homer31 said-if indeed this work is really Homer's. Yet is not rather the saying of Pittacus true,32 that "it is hard to be good"? For though we pass through many toils that are really toils, we can scarcely succeed in obtaining those goods of which, as we have already said above, no human goods can serve as an example. Therefore we ought not to idle away our time, nor for an ease that can last but a short while give up in exchange glorious hopes-that is, if we are not to be reproached and to incur retributions; I do not mean any that are inflicted here among men, although even that is no slight matter to a man of sense, but in the places of punishment, whether spend one's time beyond what is necessary, on the care of the hair or on dress, is, according to the saying of Diogenes,33 the mark of men who are either unfortunate or doing wrong. Hence, to be a dandy and get the name of being one ought, I maintain, to be considered by persons so inclined just as disgraceful as to keep company with harlots or to seduce other men's wives. For what difference should it make, at least to a man of sense, whether he is clothed in a costly robe or wears a cheap workman's cloak, so long as what he has on gives adequate protection against the cold of winter and the heat of summer? And in all other matters likewise, one ought not to be furnished out more elaborately than need requires, nor to be more solicitous for the body than is good for the soul. For it is no less a reproach to a man, who is truly worthy of that appellation, to be a dandy and a pamperer of the body than to be ignoble in his attitude towards any other vice. For to take all manner of pains that his body may be as beautiful as possible is not the mark of a man who either knows himself or understands that wise precept: "That which is seen is not the man, but there is a need of a certain higher wisdom which will enable each of us, whoever he is, to recognize himself. "34 But unless we have purified our minds this is more impossible for us than for a blear-eyed man to gaze at the sun. IX. Now purification of the soul35 - that I may speak in general terms and in an manner sufficient for your understanding - consists in scorning the pleasures that arise through the senses, in not feasting the eyes on the silly exhibitions of jugglers or on the sight of bodies which gives the spur to sensual pleasure, in not permitting licentious songs to enter through the ears and drench your souls. For passions sprung of lack of breeding and baseness are naturally engendered by this kind of music.36 But we should cultivate that other kind, which is better and leads to the better, through his use of which, as they say, David,37 the poet of the Sacred Songs, freed the king from his madness. And it is related that Pythagoras too, chancing upon some drunken revelers, commanded the flute-player who led the revel to change his harmony and play to them the Doric mode;38 and that thus the company came back to its senses under the influence of the strain, so that, tearing off their garlands, they went home ashamed. Yet others at the sound of the flute act like Corybantes and are excited to Bacchic frenzy.39 40 Such is the difference between giving full ear to wholesome and to licentious music. Hence, since this latter is now in vogue, you should participate in it less than the very basest of things. Furthermore, the mixing with the air of all manner of vapours that bring pleasure to the sense of smell, or the smearing of the body with perfumes, I am ashamed even to forbid. And what can one say about the importance of not cultivating the pleasures associated with the senses of touch and taste than that these compel those who are devoted to their pursuit to live, like animals, with all their attention centered on the belly and the members below it? But, in a single word, the body in every part should be despised by everyone who does not care to be buried in its pleasures, as it were in slime; or we ought to cleave to it only in so far as we obtain from it service for the pursuit of wisdom, as Plato advises,41 speaking in a manner somewhat similar to Paul's when he admonishes us to make no provision for the body unto the arousing of concupiscences.42 Or in what way do those differ, who are solicitous how the body may be as well off as possible, but overlook the soul, which is to make use of it, as utterly worthless, from those who are much concerned about their implements but neglect the art which uses them for its work? Hence we must do quite the opposite - chastise the body and hold it in check, as we do the violent chargings of a wild beast, and by smiting with reason, as with a whip, the disturbances engendered by it in the soul, calm them to sleep; instead of relaxing every curb upon pleasure and suffering the mind to be swept headlong, like a charioteer by unmanageable horses riotously running at large. And we ought to recall Pythagoras,43 who, on perceiving that one of his followers was putting on superfluous flesh by exercises and heavy eating, said to him, "Pray cease making your prison-house more wretched for you to live in!" It was for this reason, in fact, that Plato also as we are told, providing against the harmful influence of the body, deliberately occupied the pestilential region in Attica, the Academy,44 in order that he might prune away, as one prunes the vine of its excessive growth, the too great well-being of the body. And I myself have heard physicians say that extreme good health is even dangerous. Since, then such excessive concern for the body is not only unprofitable to the body itself but also a hindrance to the soul, that it should be subject to the body and be its servant is sheer madness. Yet surely, if we should make it a practice to despise the body, we should be slow, methinks, to feel admiration for any other thing that man may possess. For to what end shall we go on employing wealth if we scorn the pleasures arising through the body? As for me, I do not see, except that it might furnish us with a sort of pleasure to keep awake at night guarding, like the dragons of mythology, buried treasures! Assuredly, however, that man who has been trained to regard such goods as a freeman should would be quite unlikely ever to choose anything base or shameful in word or deed. For that which is in excess of any need, even if it be the gold-dust of Lydia45 or the wealth of the gold-gathering ants,46 he will despise all the more the less he needs it; and "need" itself he will, of course, define in terms of the requirements of nature and not in terms of pleasure. For those who go beyond the bounds of necessity are like men who rush headlong down a slope and, being unable to bring up against any firm object, find it impossible to halt at any point their onward impetus; nay, the more they gather in to themselves the more they require that much, or even a greater amount for the fulfillment of their desires, according to Solon son of Execestides,47 who declares: "Of wealth no limit lies revealed to men ." And we ought to use Theognis48 as a teacher in these matters, when he says: "I am not eager to be rich, nor do I pray for this, but may it be mine to live on little, suffering no evil." I admire also the scorn of Diogenes49 for all human goods without exception, who declared himself richer than the Great King by reason of the fact that he needed less for living than the King .50 But for us of today, it would seem, nothing will suffice except all the talents of Pythias the Mysian,51 and so-and-so many acres of land, and herds of cattle past numbering. But, in my opinion, we ought not to long for wealth if it be lacking, and, if we have it, we should not pride ourselves so much on its possession as on the knowledge that it is being put to good uses. For the saying of Socrates52 is well put. He, when a wealthy man was manifesting great pride in his riches, said that he would not admire him before he had found out by trial that he also knew how to use them. Would not Pheidias and Polycleitus, one of whom made the Zeus for the Elians and the other the Hera for the Argives, if they had prided themselves greatly on the gold and the ivory in them, have been objects of derision for glorying in a wealth not their own, passing over the art which enabled them to render the gold both more pleasing and more precious; but if we suppose that human virtue is not sufficient to itself for an adornment, do we imagine that what we are doing merits a lesser shame than would have been theirs? But, forsooth, are we to despise wealth and have contempt for the pleasures of the senses, and yet go seeking for flattery and adulation, and imitate the shiftiness and cunning of the fox of Archilochus?53 On the contrary, there is nothing which a prudent man must shun more carefully than living with a view to popularity and giving serious thought to the things esteemed by the multitude, instead of making sound reason his guide of life, so that, even if he must gainsay all men and fall into disrepute and incur danger for the sake of what is honourable, he will in no wise choose to swerve from what has been recognized as right. Or in what respect shall we say that a person of so unstable a character differs from the Egyptian mountebank54 who, whenever he wished, became a plant, or a wild beast, or fire or water or anything else, if in sooth he himself is at one time to praise justice when in the presence of those who esteem that, but will at another time take quite the opposite position whenever he perceives that injustice is held in honour - as is the way of flatterers? And just as the polyp,55 they say, changes its colour to match the ground on which it lies, so will he change his mind according to the opinions of those about him. X. But although we Christians shall doubtless learn all these things more thoroughly in our own literature, yet for the present, at least, let us trace out a kind of rough sketch,56 as it were, of what virtue is according to the teaching of the pagans . For by those who make it their business to gather the benefit to be derived from each source many accretions from many sides are wont to be received, as happens to mighty rivers. Indeed we are entitled to consider that the poet's saying57 about "adding little to little" holds good no more for increment in respect of knowledge of any kind whatever. Bias ,58 for instance, when he was asked by his son, who was about to depart for Egypt, what he could do that would gratify him most, replied: "By acquiring travel-supplies for your old age," meaning by "travel-supplies" virtue, no doubt, though the terms in which he defined it were to narrow, seeing that he limited to human life the benefit to be derived from virtue. But as for me, if anyone should mention the old age of Tithonus,59 or that of Arganthonius,60 or of Mathusala,61 whose life was the longest of any man's (for he is said to have lived a thousand years lacking thirty), or if anyone reckons up all the time which has elapsed since men have existed, I shall laugh thereat as at a childish idea when I gaze towards that long and ageless eternity whose limit the mind can in no wise grasp any more than it can conceive an end for the immortal soul. It is for this eternity that I would exhort you to acquire travel-supplies, leaving no stone unturned, as the proverb has it,62 wherever any benefit towards that end is likely to accrue to you. And because this is difficult and calls for toil, let us not on this account draw back, but recalling the words of him who urged that every man should choose the life which is in itself best, in the expectation that through habit it will prove agreeable, we should attempt the best things. For it would be disgraceful that we, having thrown away the present opportunity, should at some later time attempt to summon back the past when all our vexation will gain us nothing. Accordingly, of the things which in my judgment are best, some I have told you at this time, while others I shall continue to recommend to you throughout my whole life: but as for you, remembering that there are three infirmities, pray do not seem to resemble the one which is incurable, nor to exhibit the disease of the mind, which resembles that which those endure who are afflicted in body. For whereas those who suffer from the slight ailments go of themselves to physicians, and those who are attacked by more serious diseases summon to their homes those who will treat them; yet those who have reached the stage of melancholy that is absolutely beyond remedy do not even admit physicians when they call.63 Pray do you not become afflicted in this last-named manner, characteristic of the men of the present time, by avoiding those whose reasoning faculties are sound. 1 "That man is altogether best who considers all things himself and marks what will be better afterwards and at the end; and he, again, is good who listens to a good adviser; but whoever neither thinks for himself nor keeps in mind what another tells him, he is an unprofitable man." 2 "For the Spirit searcheth all things, even the profound things of God." 3 I.e. from the pagan literature of the Greeks. 4 "God said to Moses, "I am who am." He said: Thus shalt thou say to the children of Israel: "He who is, hath sent me to you." 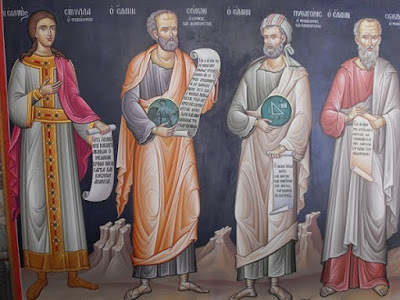 5 "Children in whom there was no blemish, well favoured, and skilled in all wisdom, acute in knowledge, and instructed in science, and such as might stand in the king's palace; that he might teach them the learning, and the tongue of the Chaldaeans." 6 Cf. Homer, Od. 12. 39 ff. 7 Cf. Prov. 4. 23: "With all watchfulness keep thy heart, because life issueth out from it." 8 "Already indeed there is plainly a fault among you, that you have law-suits one with another. Why do you not rather take the injury? Why do you not rather suffer fraud?" 9 For the commonplace, cf. Isocr. Ad Demon. 52; Plut. De aud. Poet. 12; Chrys. Hom. 12 ad Antioch. ; Greg. Naz. In Machab. C. 12; Lucretius 3. 11; etc. 10 "Badness can be got easily and in shoals: the road to her is smooth, and she lives very near us. But between us and Goodness the gods have placed the sweat of our brows: long and steep is the path that leads to her, and it is rough at first; but when a man has reached the top, then indeed she is easy, though otherwise hard to reach." Trans. By H. G. Evelyn-White in L.C.L. 12 "It would be a great task if one should recount all that Homer composed about virtue and vice," etc. Cf. also Horace, Ep. 1. 2, 1-4. 13 Cf. Homer, Od. 6. 135 ff. The reference is to Odysseus and Nausicaa. 14 Cf. Homer, Od. 8. 248 and 249. 15 "For surely 'tis Zeus poiseth the scale at one time on this side and another on that, now the be rich and now again to have nothing." Trans. By J.M. Edmonds in L.C.L. 18 Cf. Plato, Republic 2. 361 A: "For the last extreme of injustice is to appear to be just without being so." Cf. also Plato, Gorgias 527 B. 19 "'Gainst foes one watchword shall suffice-to arm." Trans. By A.S. Way in L.C.L. 20 Cf. Matt. 5. 40-44. 21 Cf. Plutarch, De curiositate 8. 71; also Arrian, Anab. 4.19. Basil does not report the story exactly according to tradition, for what is said of the wife of Darius is referred by him to the daughters. 22 Cf. Diogenes Laertius 8. 22. A contemporary and friend of Plato from Tarentum. 23 Cf. Matt. 5. 34-37. 24 I.e., the great Panhellenic contests. 25 Cf. Pausanias 6.5. Of Scotussa in Thessaly, son of Nicias, conquered in the Pancratium in the Olympic games, in Ol. 93, B.C. 408. His size was immense, and the most marvelous stories are told of his strength. 26 Cf. Pausanias 6. 14; also Pliny, Hist. Nat. 7. 20. Basil uses these two examples also in Letter CCCXXXIX. According to Pausanias, Milo used to stand on a greased quoit, not a shield, and jeer at those who charged at him and tried to drag him off it. 27 Cf. Plutarch, De mus. 5. 28 Cf, Plutarch, De virt. Alex. Or. 2. 4. Plutarch narrates the story, not of Timotheus, but of a certain Antigenides. With him it is the Orthian, not the Phrygian, strain. Cf. also Dryden's in Alexander's Feast. 29 Dio Chrysostom makes effective use of the story in the proemium to Or. 30 Cf. Dion Chrys. Or. 3. 72. 31 Cf. Margites 3 (Aristotle, Eth. Nic. 6. 7, 1141): "The gods had taught him neither to dig nor to plough, nor any other skill; he failed in every craft." Trans. H. G. Evelyn-White in L.C.L. 32 Cf. Plato, Protag. 340 c: "Nor ringeth true to me/That word of Pittacus - /And yet 'twas a sage who spoke -/Hard, quoth he, to be good." Trans. By W. R. M. Lamb in L.C.L. Pittacus, ruler of Mytilene, despaired of ruling well on the ground here stated. Cf. also Bergk Poet. Lyr. Gr., Simonides 5, and Paroemiographi Graeci, ed. Leutsch Scdohneidewin, 1, p. 172. 33 Cf. Diogenes Laertius 6. 54: "Seeing a youth adorning himself he said: 'If it is for men, you are unfortunate; but if it is for women, you do wrong.'" 34 For the general thought, cf. Plato, Phaedo 75 and 115. 35 For the thought, cf. Plato, Phaedo 82 b. 36 On the moral significance of music, cf. Plato, Republic 3. 401; also Aristotle, Politics, 8. 7. 37 Cf. 1 Kings 16. 15-23. 38 For a similar effect of the Doric mode, and with a similar allusion to Pythagoras, cf. Quintilian, Inst. Or. 10. 32. On the Doric mode, cf. Aristotle, Politics, 8. 5; and on the Ionic, cf. Plato, Republic 3. 399 A. 39 Cf. Plato, Crito, 54 D: "Be well assured, my dear friend Crito, that this is what I seem to hear, as the frenzied dervishes of Cybele seem to hear the flutes, and this sound of these words re-echoes within me and prevents my hearing any other words." Trans. By H. N. Fowler in L.C.L. 41 Cf. Plato, Republic 6. 498 B and C. "In childhood and youth their study, and what philosophy they learn, should be suited to their tender years; during this period, while they are growing up towards manhood, the chief and special care should be given to their bodies, that they may have them to use in the service of philosophy; as life advances and the intellect begins to mature, let them increase the gymnastics of the soul; but when the strength of our citizens fails and is past civil and military duties, then let them range at will and engage in no serious labour, as we intend them to live happily here, and to crown this life with a similar happiness in another." Trans. By Jowett. 42 Cf. Romans 13. 14: "But put ye on the Lord Jesus Christ, and make not provision for the flesh in its concupiscences." 43 These words ascribed by Basil to Pythagoras are assigned by Stobaeus (Serm. 77 p. 456) to Plato. 44 On the unhealthful location of the Academy, see Aelian, Ver. Hist.9. 10; Plato, in reply to the physicians who advised him to quit the Academy and live near the Lyceum, said: "Nay, as for me, I would not be persuaded to move even to Mount Athos in order to prolong my life." Cf. also Frazer's Pausanias II, pp. 388-9, who explains the cause of the unhealthfulness. 45 Cf. Herod. Hist. 1.93. 46 Cf. Herod Hist. 3. 102. 47 Elegies 11. 71 (in L.C.L. 13. 71). This line is also cited for Theognis, no. 227. 49 I.e. Diogenes of Sinope. For the story, cf. Aelian, Ver. Hist. 10.16; also Plutarch, De fort, et virtut. Alex. Or. 1.311. 50 Cf. Dion Chrys. 6. 6. 51 Cf. Herod. Hist. 7. 27. Pytheas, reputed to be the richest man in the world, told Xerxes that he possessed 2,000 talents of silver, 393,000 gold darics (staters), not to speak of other kinds of property. 52 Cf. Dion Chrys. 3. 102. Cf. also Cicero, Tusc. 5. 12. 53 I.e. Archilochus of Paros. Cf. Bergk, Archilochus, Poet. Lyr. Gr., 89. 5. The fox made an alliance with the eagle, but the eagle broke faith by killing the young of the fox when he was absent. The fox got his revenge by taking a brand from an altar and setting fire to the eagle's nest. Cf. Plato, Republic 2. 365 c: "For a front and a show I must draw about myself a shadow outline of virtue, but trail behind me the fox of the most sage Archilochus, shifty and bent on gain." Trans. By Paul Shorey in L.C.L. 54 Proteus is meant. Cf. Homer, Od. 4. 384-386: "There is wont to come hither the unerring old man of the sea, immortal Proteus of Egypt, who knows the depths of every sea, and is the servant of Poseidon." Trans. By A. T. Murray in L.C.L. Plato in Euthydemus (288 B) has Socrates compare the trickery of the sophists to that of Proteus the Egyptian. 55 Theognis 215 ff. Cf. Athenaeus, 7. 316 f. Plutarch also makes frequent use of this comparison as in De amicor. Mult. 6, p. 365, De adulat, et amic. Disor. p. 187 and p. 193. 56 For the expression, cf. p. 428, note 1. Cf. also Plato, Phaedo 69 B. 57 Cf. Hesiod, Works and Days, 361 and 362: "For if you add only a little to a little and do this often, soon that little will become great." Trans. By H.G. Evelyn-White in L.C.L. 58 One of the seven wise men of Greece. For the saying, cf. Diogenes Laertius, 1. 88. "Make wisdom your provision for the journey from youth to old age." 59 Cf. Homeric Hymns, 5. 218 ff. ; also Horace, Odes 1. 28. 7 and 2. 16. 30. 60 Cf. Herod. Hist. 1. 6. 3. 61 Cf. Gen. 5. 25. 62 The saying is ascribed to Pythagoreans. Cf. Plutarch, "For there is that noble precept of the Pythagoreans: Choose the best life and habit will make it sweet." 63 For whereas those who suffer...call. The thought of this passage seems to have been suggested by Plutarch, Quomodo quis suos in virtute sentiat profectus, 81 f.